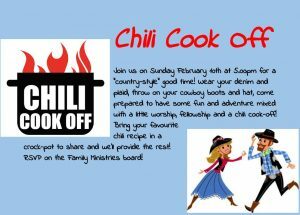 Sunday February 10th at 5.0opm Chili Cook Off, as part of our Winter Warm Up Series of events. Please join us for a country-style good time! Wear your denim and plaid, throw on your cowboy boots and hat, come prepared to have some fun and adventure mixed with a little worship, fellowship and chili cook-off! Bring your favourite chili (or soup!) recipe in a crock-pot to share and we’ll provide the rest!